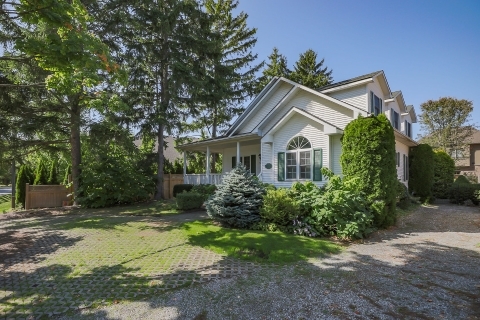 Vintner's Cottage is located in historic "Old Town Niagara-on-the-Lake." Picturesque and charming, the town features several attractions and activities whether you are taking a holiday break or a vacation retreat from hectic living (most attractions and activities are within 1 mile of the cottage). Vintner's Cottage is located at 599 King Street, just 6 blocks west from the town centre (at King and Queen). The historic commons area with biking/walking paths is one block east at John Street (across from the Pillar and the Post). The biking/walking path leads to the Niagara River (3/4 mile from the Cottage) and actually leads all the way to Niagara Falls  which is approximately 15 miles away. The Shaw Theatres and Fort George are also within 1 mile of the cottage. Niagara-on-the-Lake is open all year round! Located at the mouth of the Niagara River, the historic area offers a moderate climate that is home to Canada's foremost wineries. Visit the official Niagara-on-the-Lake site for more information.